The VIP entrance of Art Basel Hong Kong that just closed its doors in HK. The irresistible combination of Art with amazing works by contemporary artists like Zhang Xiaogang, Kenny Scharf, William Klein, to Picasso, Modigliani, Basquiat or Henry Moore, Keith Haring and David LaChapelle, vast sums of money that need to be invested or laundered, and billionaires on a tax-free shopping spree: Art Basel Hong Kong. Philip-Lorca diCorcia – this arresting portrait of a girl, dressed as a maid reflecting for a moment in an anonymous mansion. Hong Kong was last week the center of attention of the art world and by the time Art Basel Hong Kong closed its doors last sunday billions of dollars worth of art had changed hands. Some galleries had a very good week indeed with most of their inventory sold within hours of opening their doors on the first day » VIP Private viewing. By a calendar coincidence I was in Hong Kong last week and by luck I was (through my friend Ray) invited at the Vernissage of #HKBasel2014. 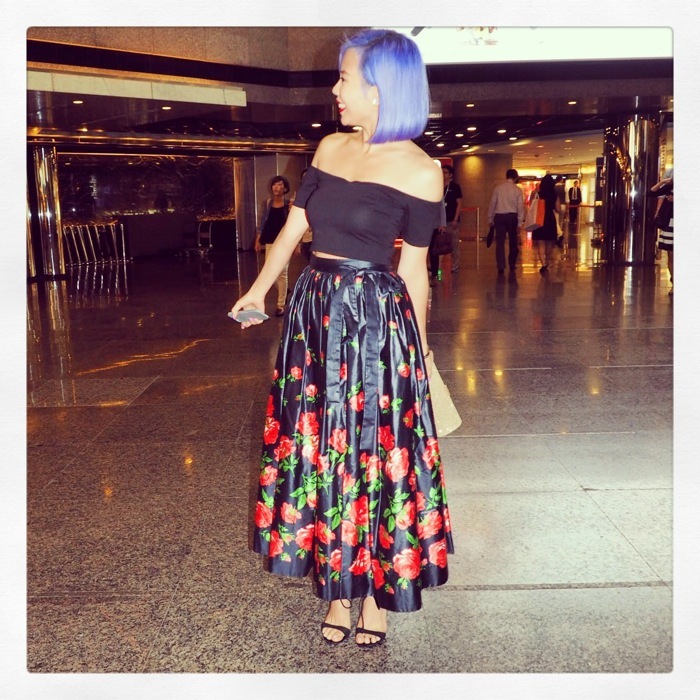 That hashtag bounced for 5 mad days from art galleries to chic restaurants and back to the Hong Kong convention center as Hong Kong temporarily became the center of the Art World. I felt for a few moments as if I had been transported unto another planet. A planet where everyone is (very) rich, dressed to the nines in impossibly high heels and when casually requesting the price of this piece by Chinese artist Zhang Xiaogang is told in whispered tone « Oh, 6 million dollars, but i am afraid it is sold already ». Zhang Xiaogang. One more recent piece from his Bloodlines series. A friend of mine bought one of these enormous piece in the late 90s and I would stare at it for hours. « Bloodlines » are gigantic watercolours portraits falsely simple that represent a painful and poignant study on the links of loss and pain shared by the entire Chinese people after the Cultural Revolution. The contrast between the ‘photographic’ style of the portraits, their psychological loss and that red line that zings from one to the other are mesmerizing. 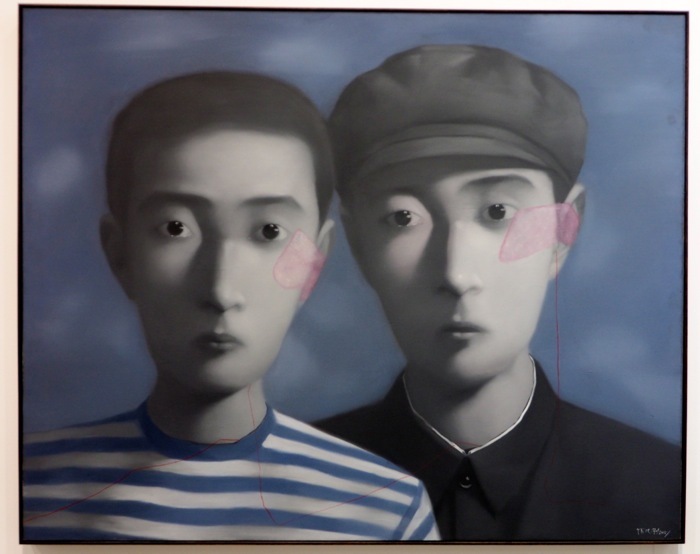 Zhang Xiaogang is now the most expensive contemporary living Chinese artist. Mother and Child by Henry Moore. While the little red dots were multiplying, I strolled the aisles looking at the walls while of course keeping an eye out for the elusive stylish creature that will make me want to grab my camera. Sadly while the art was abundant, style was thin on the ground. With a few exceptions naturally. The Hong Kong moneyed crowd sees itself as more sophisticated and more « au courant » than its mainland counterpart, I find their style remarkably dull. Not all of them of course, I did see a few fun stylish girls and women, but for the most part, the Hong Kong women look as if their outfit was selected on a catalog at Joyce or Lane Crawford*. I have the same feeling about Cannes right now: styled to the hilt, yes, sure, but without a hint of personality. This was valid in the streets as well. * Local expensive multi-brands stores. Of course, there are always a few exceptions, like for example here, Florance Yip in her head-to-toe Fendi was quite fabulous. I particularly loved the fun fur ogre she was sporting on her mini bag. A rare sight, Belle du Jour in her homemade outfit. Very cool in her ‘Flashdance’ modern vibe. She was an art student, of course. Kenny scharf iconic and adorable creatures. Mega MengMeng, casual chic in her Balenciaga jacket over a loose silk dress. Beijing Style Belle du Jour. 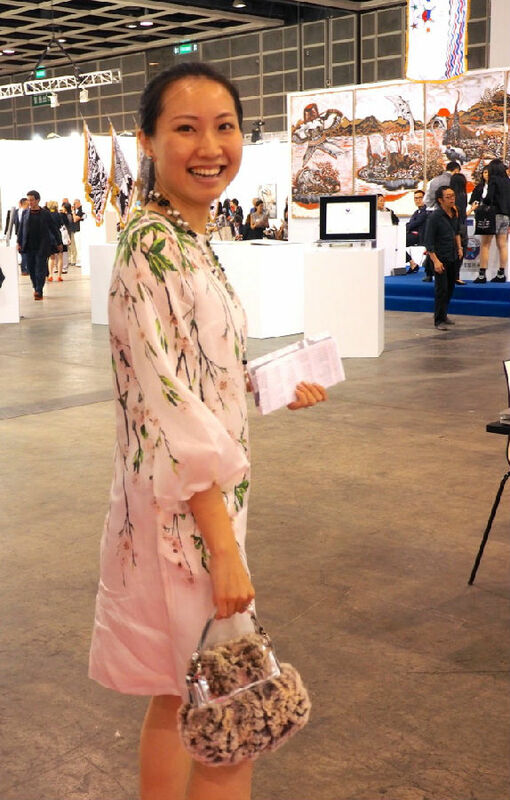 Of course Art Basel does business with the entire rarefied world of the SuperRich attracted by the tax-free status of Hong Kong, a week of great food, art and serious shopping. In Hong Kong, there is virtually no point in shopping at the Duty Free shops of the airport as the prices are the same in town. Big Money – Little Style. While the Chanel, Louis Vuitton or Bang and Olufsen stores on the island saw their cash registers tilt non-stop, ABHK aisles were buzzing in French, English, Portuguese, Italian, Cantonese but mainly they spoke Mandarin. On opening night, I bumped into Beijing It-Girl Mega Meng Meng. 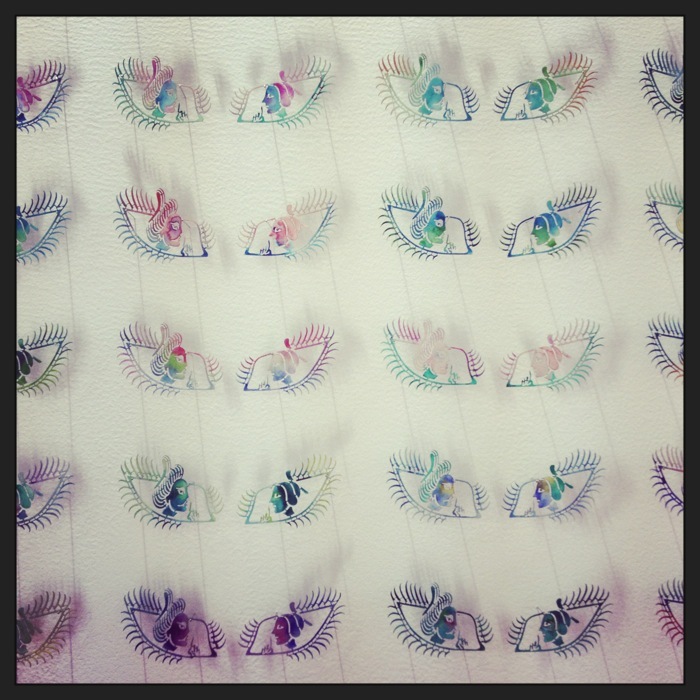 Details of an enormous piece inspired by the traditional chinese art of paper cutting. Sadly I did not note the name of the artist. Absolutely amazing no? Stylish and fun. Belle du jour. Still Life by David LaChapelle – 2009-2012. 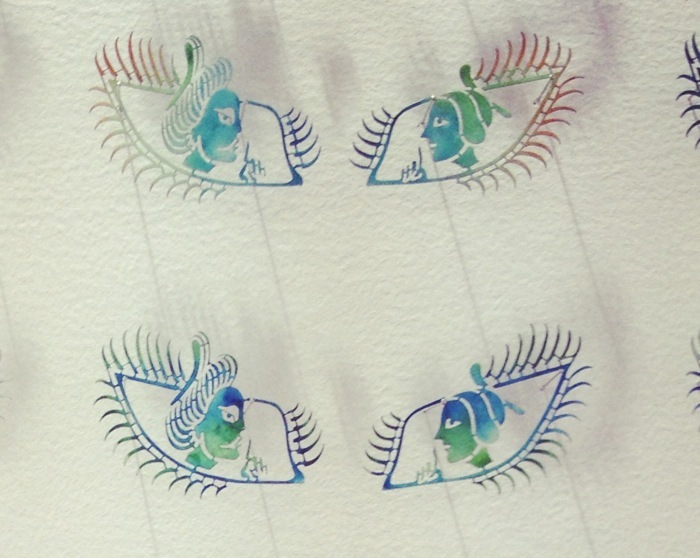 I was mesmerized by this piece from a gallery in Brussels. David LaChapelle found a collection of abandoned and damaged figures of cultural icons from Madonna (above) to JFK, Elvis or Margaret Thatcher in an old wax museum in Ireland. This old ‘young’ Madonna, discarded, damaged, oddly poignant as she looks on was strangely more ‘vivid’ than most wax statues. I could not help to wonder how would i feel if I was confronted by my own 20 years old self in such a vivid ‘Still Life’? How did Madonna? I was also fascinated by the ‘blind’ breasts, identical to my friend’s after their battle with cancer. 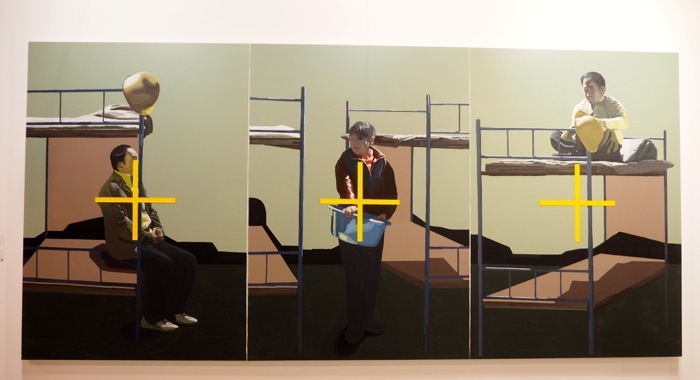 The curator was not sure the Chinese public would understand this particular piece. I loved it. 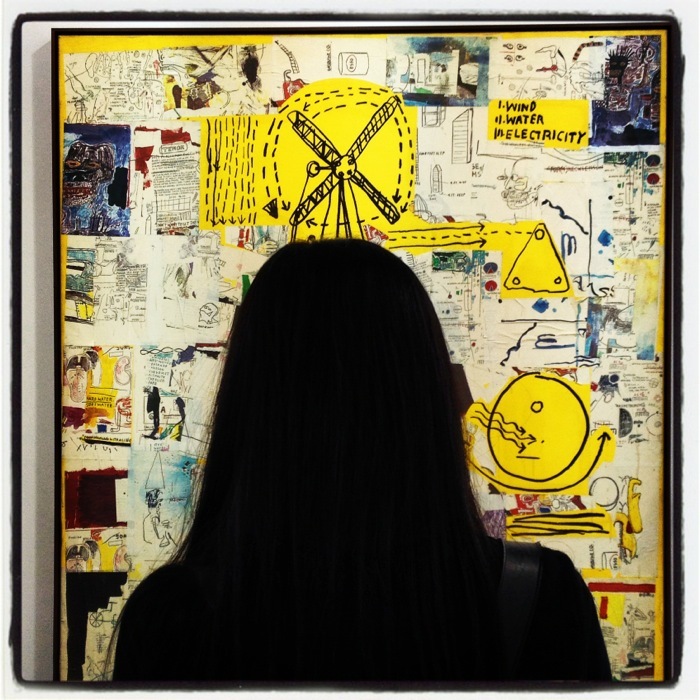 I lived in New York while Jean Michel Basquiat was working. I did not understand his violence, talent and pain then. I do now. I wish I had bought one for a few thousand dollars when I could. 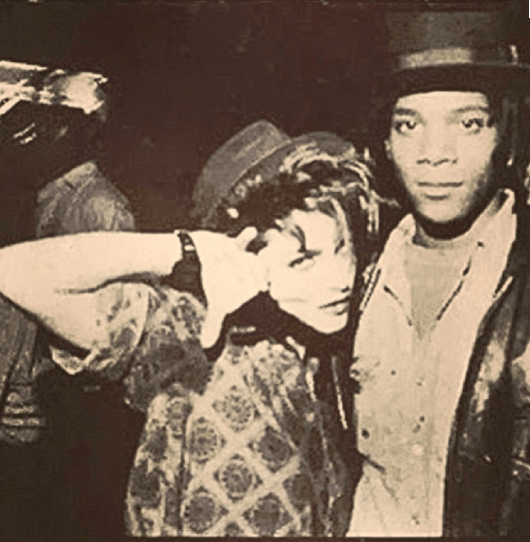 Ironically 20 years old Madonna and Basquiat were close friends then, today both were hanging on the walls of Art Basel Hong Kong. A pretty girl with the same Buddhist Khmer Pali incantation tattoo as Angelina Jolie’s (done with knives, this is a particularly painful process). A beautiful girl arriving at the vernissage. 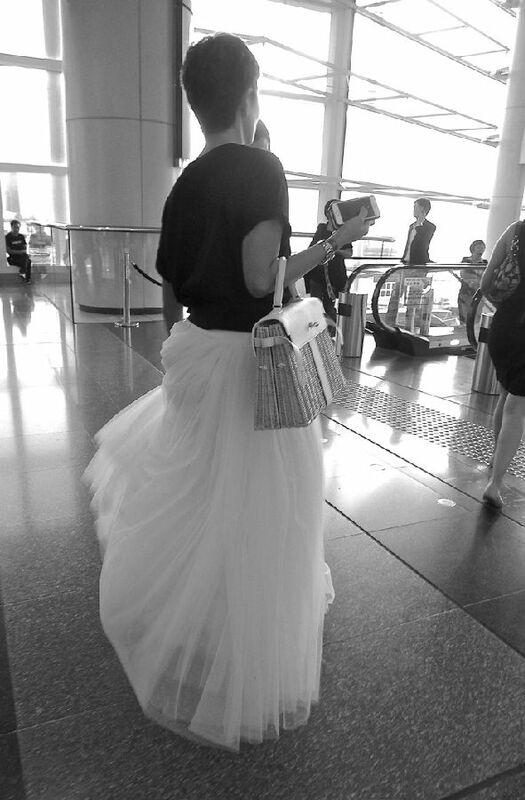 I loved her hair, of course and the contrast with the Ball-gown like skirt. I did not take note on the piece when I took the picture above which i regret. These beds common all over China’s big cities are usually the only ‘intimate’ private home of many poor migrant workers. I have seen many rooms that contained up to 12 of such beds in Beijing. They are usually hidden on the -3rd or -4th floors of many shopping malls parking lots. This is where ‘the invisible’ migrant people live with all their belongings stored above and underneath their beds, usually isolated from view with a simple blanket. Pretty in Pink. Priceless Dolce and Gabbana and Chanel necklace. The new It-place in Hong Kong, the fabulously artsy and fun « BIBO » located on 163 Hollywood Road Sheung Wan. 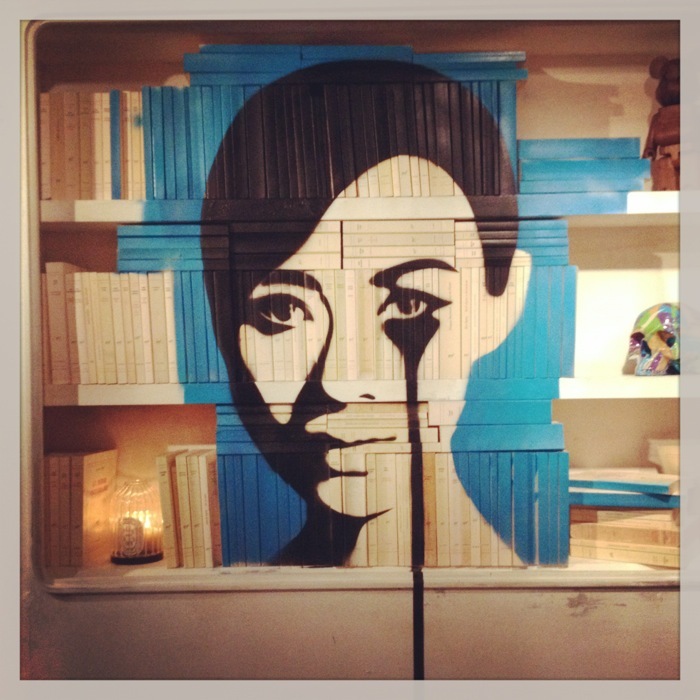 There seem to be a trend in Hong Kong right now about painting portraits directly unto the books, like here, Tina Chow at Bibo over countless Gallimard. « At least, if they will remained closed, they should be pretty » seems to be the current consensus. One is meant to check one’s large bag at Bibo’s entrance. 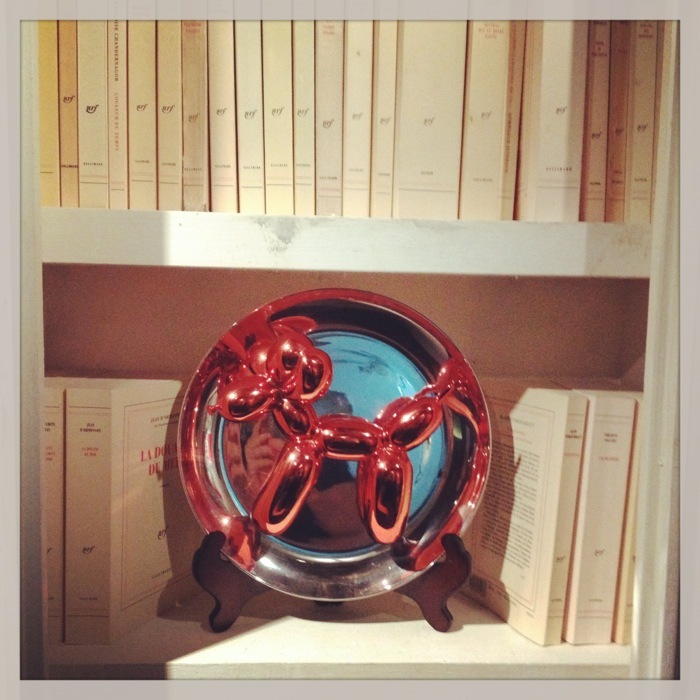 What with the priceless Jeff Koons « Puppy » on display and all… Fair enough. 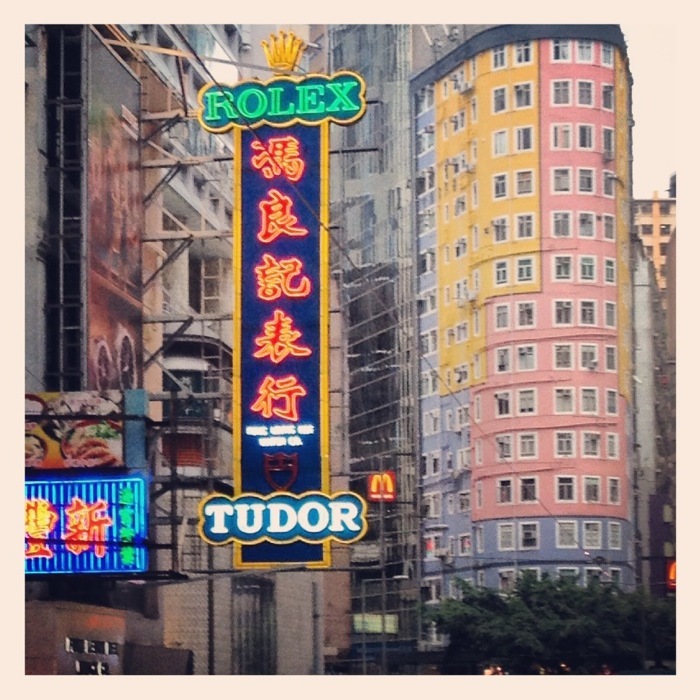 Good to be home, more on my trip to HK and Shanghai soon.